US ultra low-cost carrier Spirit Airlines believes consolidation among the country’s major carriers and larger low-fare airlines continues to create opportunities for niche players to fill service gaps created by the four mergers that have occurred in the industry since 2005. The airline remains so bullish on its growth prospects domestically that it is growing capacity during 2013 by 18% to 22%, a growth rate the carrier aims to maintain through 2015. But Spirit could face hurdles in maintaining that explosive growth as its unit costs continue to climb, and its continued penetration of the top US markets will also inevitably slow as the opportunities for exploitation shrink. After turning its focus away from building up a strong presence in the Caribbean and Latin America from its Fort Lauderdale hub, Spirit during the last couple of years has set its sights on the domestic market, making a push into legacy strongholds under the premise that it can charge ultra low fares and stimulate low-yielding traffic that most other airlines would choose to abandon. Based on data from the US Department of Transportation, Spirit serves seven of the top metro areas based on enplaned passengers from Jan-2012 to May-2012. It is the second largest carriers in Dallas/Fort Worth, has established a crew base in Las Vegas, and also serves major routes from Chicago and Denver. It serves Phoenix from Phoenix-Mesa Gateway Airport, and Houston through Houston Intercontinental, a major hub for United Airlines. 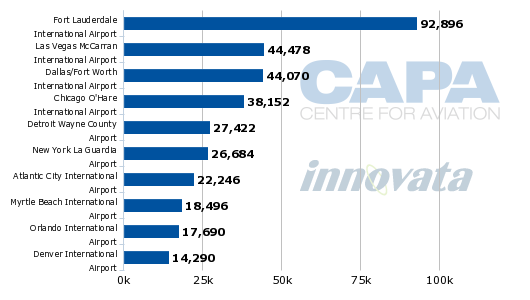 Four of Spirit’s top 10 bases in terms of seat deployment are featured in the DoT’s top 10 airports. 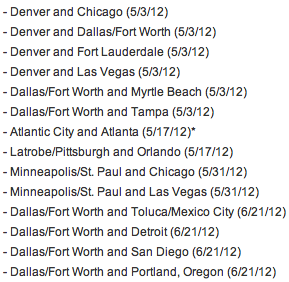 Between Sep-2012 and Jun-2013 Spirit will launch 22 new routes, 19 of which are in the continental US. From Feb-2012 to Jun-2012 the carrier introduced 20 new route pairings, with 19 operated in the domestic US (see Background info). Spirit’s logic is based on a formula that entails 40% traffic stimulation in a given market through the introduction of two-to-three daily flights with fares that are 25% below market average. The carrier’s business model is based on charging the lowest fares possible and then instituting additional fees for other aspects of the travel experience including bag fees (even for carry-on bags that can only fit in the overhead bins), refreshments and even printed boarding passes. Overall, the carrier is pleased with its strategy. During a 3Q2012 earnings discussion, Spirit CEO Ben Baldanza concluded that Spirit’s average load factor on routes it has served for two years or less is 84%, and “many times we see this level of load factor within just the first few weeks of service”. Mr Baldanza remarked that Spirit’s loads on routes with a maturity level of five years averaged 86%. As the domestic service expansion continues into 2013 through new service launches that include eight new routes from Dallas/Fort Worth, Spirit believes there is room for more US domestic expansion. Joining Mr Baldanza, Spirit chief marketing officer Barry Biffle explained that during the last few years consolidation and mergers have resulted in a favourable yield environment, “and we don’t see that changing any time in the near future”. As US majors enjoy higher yields, Spirit with it low-cost base can create a traffic base drawn to its lower fares. (Yield is a revenue metric directly tied to ticket prices.) “We’re principally focussed on domestic growth because of the yields and that’s where you’ve seen our growth deployed,” said Mr Biffle. Despite Spirit’s bullish attitude about growth prospects in the US domestic space, not all of its new routes have achieved success. The carrier is ending service from Dallas/Fort Worth to Boston in Nov-2012, just eight months after service entry. 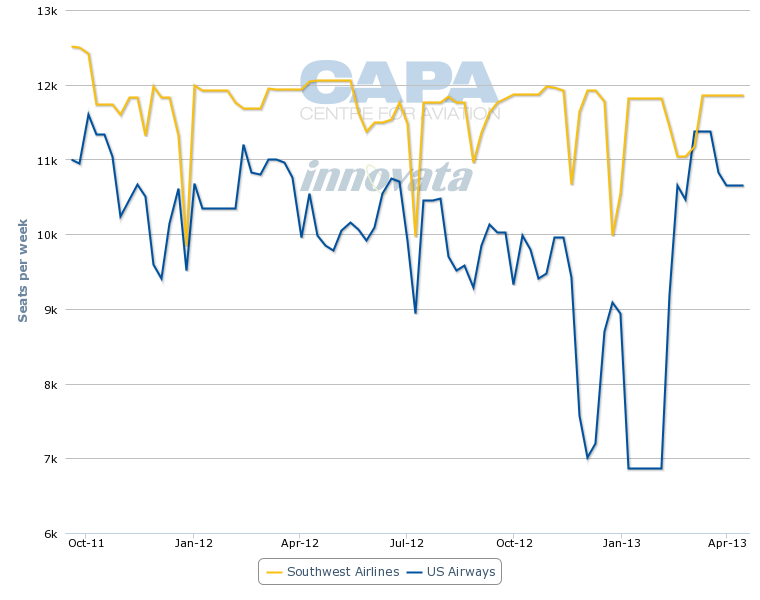 Spirit’s cessation of service between Dallas and Boston was preceded by the elimination of service in Sep-2012 from Chicago O’Hare to Los Angeles. One common thread in both those markets is in addition to legacy competition, Spirit also competed with hybrid carriers, which offer low fares but a certain level of frills. Both American and JetBlue operate the Dallas-Boston pairing. JetBlue offers one free checked bag and free snacks while also catering to business travellers through its “Even More” upsell product that includes expedited security access and seats with more legroom. With its ticket prices presumably falling in between that of Spirit and American, some of the passengers Spirit hoped to capture in the market likely gravitated toward JetBlue for a fraction more. American, United and Virgin America all serve Chicago O’Hare-Los Angeles. Virgin America has a similar product to JetBlue, offering some free amenities while featuring a fully-fledged business class that is cheaper than business class offerings on traditional legacy airlines. Spirit likely encountered challenges in stimulating enough passengers on that particular route as Virgin America was able to capture customers willing to pay for frills included in its ticket prices that Spirit offers as ancillary add-ons. Spirit’s latest route elimination is the Phoenix-Mesa-Las Vegas pairing, a route where it competes directly with fellow ultra low-cost carrier Allegiant Air. Allegiant’s model is somewhat different from Spirit as Las Vegas-based Allegiant’s business is built on linking small US markets with large leisure destinations through low-frequency weekly service. Allegiant is the largest carrier at Phoenix-Mesa in terms of seats on offer, and once Spirit announced its plans to offer flights to Las Vegas, Allegiant quickly put together plans to link Phoenix-Mesa and Las Vegas, uncharacteristically serving the market six times per week. Spirit’s decision to axe its Phoenix-Mesa-Las Vegas service does not appear to be based on pressure from Allegiant, but rather the nature of the Phoenix market, which includes the region’s main airport Phoenix Sky Harbor that serves as a major hub for US Airways. Mr Biffle stated that lower yields recorded by carriers operating from Sky Harbor prohibited Spirit from attaining its normal levels of stimulation. He remarked it is a condition Spirit has not witnessed “but for that route”, and the carrier has not seen that scenario replicated on Spirit’s other routes from Phoenix-Mesa (which includes service to Dallas/Fort Worth and Denver), or elsewhere across its system. While Phoenix Sky Harbor is a hub for a US major carrier, it is smaller and its traffic mix has a higher leisure bent than other legacy fortresses such as Chicago O’Hare, Dallas or Atlanta. One of the factors US Airways always stresses when it declares it must maintain a lower cost base than its legacy peers is that its hubs generate less revenue than those of American, Delta and United. Phoenix Sky Harbor is US Airways’ third largest hub in terms of seat deployment. In addition to competing with Allegiant from Phoenix-Mesa to Las Vegas, Spirit also competed with US Airways and Southwest in the market. Combined, US Airways and Southwest offer more than 21,000 weekly seats between Sky Harbor and Las Vegas, which is primarily a leisure market. Ample capacity combined with low base fares offered by those carriers prohibited Spirit from attaining its passenger stimulation targets. Publicly, Spirit is not daunted by its exit from the Phoenix-Mesa-Las Vegas market, or any other route pairing as Mr Biffle noted that if a route doesn’t perform to the carrier’s financial expectations, “we’re not going to sit around and wait for a year or two to get something strategic in the works”. Spirit’s nearly 12% increase in net income during 3Q2012 to USD31 million and its top line revenue growth of 19% to USD342 million was somewhat overshadowed by a 20% rise in operating expense to USD293 million. It was also the second consecutive quarter that Spirit recorded a significant rise in unit costs as its costs per available seat mile, excluding fuel, increased nearly 5% after growing almost 12% year-over-year during 2Q2012. Much of the increase during 3Q2012 was driven by higher passenger re-accomodation costs due to flight cancellations and expenses from aircraft Spirit wet-leased during Summer 2012. Spirit’s stage length also decreased 1.9% year-over-year during 3Q2012, which accounted for roughly 1ppt of the unit cost increase. 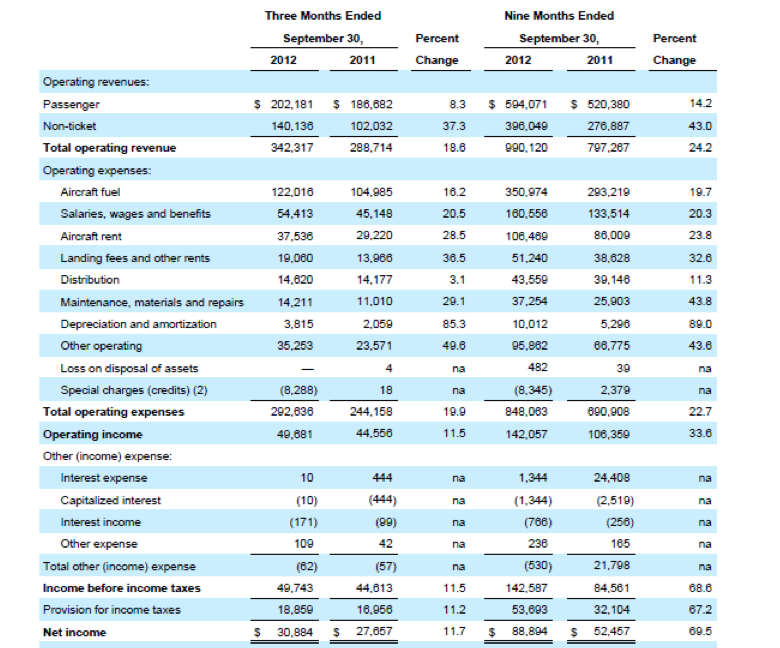 The carrier estimates its unit costs during 4Q2012 should fall 2% to 3% to a range of USD5.90 cents to USD5.95 cents. While Spirit’s 3Q2012 USD6.02 cent unit costs are among the lowest in the industry, and despite the assurance that unit costs will fall during 4Q2012, the carrier is fielding questions regarding how it can sustain its planned capacity expansion during 2013 against the potential of rising costs. Spirit CFO Ted Christie stressed the planned 18%-22% capacity growth would actually give the carrier momentum in 2013 from a unit costs perspective, as the addition of nine new Airbus narrowbodies would grant the carrier some leverage in its maintenance expense. Spirit also anticipates an increase in its average stage-length and a change in fleet mix will also help the carrier manage unit cost creep. Seven of the planned nine aircraft deliveries during 2013 are larger-gauge 178-seat A320s compared to the 145-seat A319s operated by Spirit. Mr Baldanza stated the A320 was a “unit cost good guy” for Spirit as the larger narrowbodies are 8% more unit cost efficient than the A319s. The airline’s current fleet projections show Spirit should end 2013 with 29 A319s and 23 A320s, compared with a year-end 2012 total of 27 A319s and 16 A320s. Spirit’s rapid network expansion will likely slow in 2013, which means some the planned capacity growth will be absorbed by a higher number of larger aircraft in the carrier’s fleet. Mr Baldanza stated Spirit’s opening of new cities will likely slow a bit “since we’re already in most of the places we want to be”. Another potential cause for concern was the 3.4% decline in Spirit’s unit revenues during 3Q2012 to USD11.52 cents. 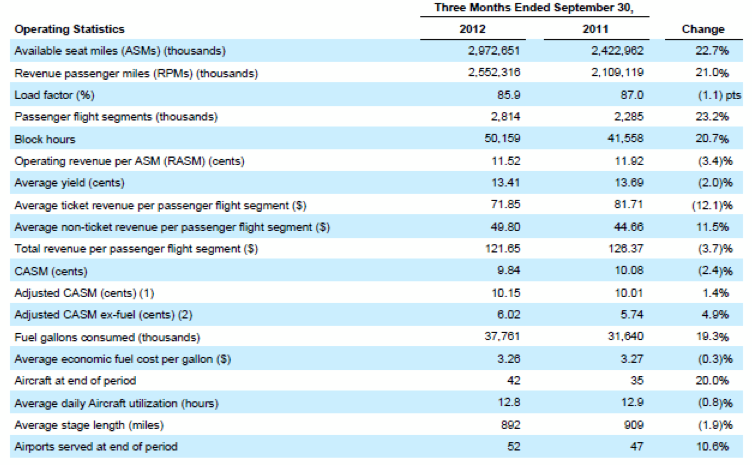 Carrier executives noted that revenue per available seat mile grew 28% year-over-year during 3Q2012, aided by performance in a lot of new markets the carrier introduced. Spirit also passed on the benefits of the lapses in the US FAA’s ability to collect certain taxes onto passengers, and Mr Baldanza stated that stimulated demand, which resulted in the carrier not discounting as intensely as normal. Factoring out that unusual circumstance, he estimated Spirit’s unit revenue would have grown slightly during 3Q2012. Despite concerns over cost creep and sustaining unit revenue momentum, Spirit’s overall financial performance continues to be robust as its profits for the nine months ending 30-Sep-2012 grew nearly 70% to USD89 million and its operating income increased 34% to USD142 million. While concern about its double-digit growth rates going forward is legitimate, the airline’s fleet at year-end 2012 of 45 aircraft is comparatively small, which allows it to nimbly redeploy capacity quickly if its calculus of traffic stimulation fails to materialise in certain markets. But Spirit can only misfire on its calculations on a limited scale in order to keep its financial metrics climbing in the right direction. As it rounds out its network, the opportunities for capacity redeployment will shrink, decreasing the scale of opportunities Spirit will have to stimulate new traffic.